I think about this quote a lot. And when I think about it, it is in multiple contexts. I think about it theologically, as G.K. no doubt intended. But I also think about it in the context of the role that innate curiosity plays in driving creativity and innovation. On its face, the quote can be a perplexing one, with double entendre and the interplay of “wonder” and “wonders”, not surprising from the man some called the “prince of paradox”. But I believe there is a straightforward interpretation that should resonate in the programmed, information-saturated world in which we live and work today. The quote raises all sorts of questions in my mind. Are we, by nature, a curious people? Or are we satisfied with the ordinary, with the status quo? Does the inundation of technology, information, protocols and programs work in favor of, or against, our curiosity? I remember, as a kid, that I was constantly taking things apart to see how they worked … disassembling the toaster, the radio, taking the tubes out of the back of the TV (yes, TVs had tubes when I was a kid), usually to my parents’ chagrin. Some readers who are old enough will remember Crystal radio kits … I had one. All of these activities fed an insatiable curiosity, a desire to understand the world around us, with its many wonders. The world is, indeed, filled with wonders, with curiosities. There is so much we don’t understand. Curiosity, the desire to understand new things, “how things tick”, the wonders around us, is what drives creativity and innovation. 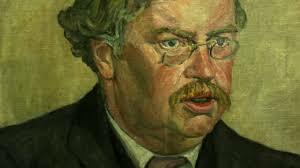 To paraphrase G.K. Chesterton, it will be our lack of innate curiosity, not the lack of curiosities around us, that will be our undoing. For it is our curiosity that will drive us to push against the frontiers of knowledge and understanding, to create new things, to innovate. To push us beyond the ordinary, the status quo. To grow. Are you just going through the motions? Overwhelmed by information overload?? Is the day-to-day “stuff” and incessant noise getting in the way?? Maybe it’s time to slow down and force ourselves to take in the wonders around us, to look at things through an insatiably curious lens. It will make a difference. Not only in the way we see things. But it just might lead to a breakthrough idea that would otherwise have eluded us.